They ship in the tourists by bus and the walkways are wheelchair enabled. 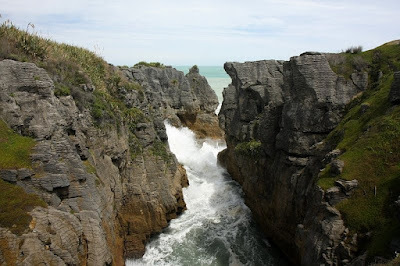 The Pancake Rocks and Blow Holes in Punakeiki are the most touristic thing I have seen in New Zealand yet. 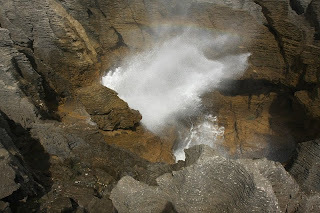 The sound the water makes as it surges through the caves inside the limestone is awesome, and the water bursting out of the blow holes looks cool. The rock formations, looking like one of those card board reliefs our fourth grade teacher had us build, are amazing to look at. But all in all, I felt quite empty as we came back to the visitor center. As if the site, which would be wonderful if experienced standing alone on a wind swept cliff, was not at ease with they way it was marketed. Sure it is all very tame when compared to other places where whole towns have sprung up around natures wonders, but for my time in New Zealand this was a first.